detailed portrait of a vanished world while honoring its timeless relevance, The Peloponnesian War is a chronicle of the rise and fall of a great empire and of a dark time whose lessons still resonate today. Harper Collins, 2003-11-03. Hardcover. Used:Good. 2010-04-05. New. Ships with Tracking Number! INTERNATIONAL WORLDWIDE Shipping available. Buy with confidence, excellent customer service! 2010-09-02. New. Ships with Tracking Number! INTERNATIONAL WORLDWIDE Shipping available. Buy with confidence, excellent customer service! 2003-01-05. New. Ships with Tracking Number! INTERNATIONAL WORLDWIDE Shipping available. Buy with confidence, excellent customer service! 2003-01-05. Good. Ships with Tracking Number! INTERNATIONAL WORLDWIDE Shipping available. May not contain Access Codes or Supplements. May be ex-library. Shipping & Handling by region. Buy with confidence, excellent customer service! New York: Viking, 2003. First Printing [Stated]. Hardcover. Very good/Very good. Jeffrey L. Ward (Maps) and Michael Marsland (autho. xxvii, , 511,  pages. Maps. 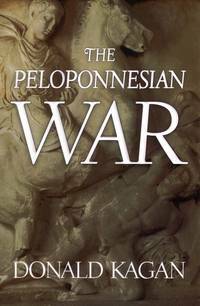 Sources for the History of the Peloponnesian War. Index. Minor edge soiling. DJ has slight wear and soiling. Donald Kagan (born May 1, 1932) is an American historian and classicist at Yale University specializing in ancient Greece, notable for his four-volume history of the Peloponnesian War. He formerly taught in the Department of History at Cornell University. At present, Kagan is considered among the foremost American scholars of Greek history. Known for his prolific research of the Peloponnesian War; Kagan is also famous for his work On the Origins of War and the Preservation of Peace, a comparative history examining four major conflicts (the Peloponnesian War, World War I, the Second Punic War, and World War II) and one non-conflict (the Cuban Missile Crisis) with the purpose of identifying how and why wars do or do not begin. The National Endowment for the Humanities (NEH) awarded Donald Kagan the National Humanities Medal in 2002. Derived from a Kirkus review: The tale of an ancient conflict, with ample leadership lessons for contemporary statesmen on fate and miscalculation. The Peloponnesian War (431-404 b.c.) ended a golden age of peace, prosperity, and cultural achievement in the Hellenic world. It featured Sparta, the leading army and authoritarian regime in Greece; Athens, the greatest naval power and imperial democracy; and allied city-states. With the death of Pericles two years into the war, Athens lost firm, consistent leadership and thereafter veered between peace and expansionist factions. At the end of hostilities, both sides had abandoned their war aims. The author points out innovative tactics, such as the use of enormous flame-throwers, with the same dexterity that distinguishes his portraits of major personalities like Nicias, the Athenian general who turned the Sicilian campaign of 415 b.c. into a debacle. Authoritative history demonstrating that the reactions of leaders during wartime have altered little. Viking. Hardcover. 0670032115 New Condition. . New. Penguin Books. PAPERBACK. 0142004375 New Condition. . New. Paw Prints 2008-05-29, 2008-05-29. Library Binding. Used:Good. New York: Viking, 2003 For almost three decades at the end of the fifth century B.C., Athens and Sparta fought a war that changed the Greek world and its civilization forever. A conflict unprecedented in its brutality, the Peloponnesian War brought a collapse in the institutions, beliefs, and customs that were the foundations of society. Today, scholars in fields ranging from international relations and political and military history to political philosophy continue to study the war for its timeless relevance to the history of our own time. Now Donald Kagan, classical scholar and historian of international relations, ancient and modern, presents a sweeping new narrative of this epic contest that captures all its drama, action, and tragedy. In describing the rise and fall of a great empire he examines the clash between two disparate societies, the interplay of intelligence and chance in human affairs, the role of great human beings in determining the course of events, and the challenge of leadership and the limits in which it must operate. The result is an engrossing, fresh perspective on a key historical event that will be welcomed by general readers and history buffs alike-and anyone seeking a better understanding of the pivotal events that shaped the world as we know it. 511p.maps, bibliography,index.. 1st US Edition.. Hard Cover. New/New. Penguin Books, 2004. Paperback. New. 8.4 x 5.5 cm. Viking. Hardcover. 0670032115 Like New Condition. . Fine. Penguin Books. PAPERBACK. 0142004375 Like New Condition. . Fine. Paw Prints 2008-05-29, 2008-05-29. Reprint. Library Binding. Good. Paw Prints 2008-05-29. LIBRARY BINDING. 1435290364 Book is clean. Crisp pages. Tight binding. Moderate shelf wear on cover. Dented corner. . Very Good. New York: Viking [0-670-03211-5] . (Hardcover) xxvii, 511pp. Near fine in near fine dust jacket. Maps, index. Locale: Greece. (Military, Classical History, Military--Greece, Peloponnesian War). New York: Viking Press, 2003. 1st. Hardcover. Book fine, Dust jacket fine..
Penguin Books. PAPERBACK. 0142004375 Special order direct from the distributor . New. New York: Viking. Hardcover. 2003. 1st Edition. 8vo 511pp . Near Fine in Near Fine DJ. One bottom corner slightly bumped . Penguin Group USA. Reprint. Politics & History. New. Brand New: This item is brand new unopened, never used and still in its original manufacturer condition. New York, Etc. : Viking, 2003. xxvii, 511p., maps, dj. Harper Collins, 2003-11-03. Hardcover. Good. Penguin Books, 2004-04-27. Reprint. Paperback. Used:Good. Penguin Books. PAPERBACK. 0142004375 . New. Penguin Books. PAPERBACK. 0142004375 Minor shelf wear . Very Good. Penguin Books. PAPERBACK. 0142004375 signs of little wear on the cover. . Very Good. Penguin (Non-Classics), April 2004. Paper Back Paper Back. New. New York, New York, U.S.A.: Viking Press, 2003. Hardback. Very Good/Very Good. Book Club. New York, New York, U.S.A.: Viking Press, 2003. clean, unmarked copy.. Hardback. Very Good/Very Good. Book Club. Viking, 2003. Large, thicker, heavy sturdy book, dark red spine, cream-marbled boards, creases at bottom front tip, very bright gilt lettering and design on spine, 511 pages with some maps. DJ glossy with a bas-relief of warriors fighting on front and spine, praise on back from George Steiner, the New Yorker, Richard Bernstein in New York Times and others. DJ has tiny nick at top back tip. Near Very Fine DJ/Fine book.. 2d. Hard Cover. Fine/Near Very Fine. Viking. Used - Very Good. 2003. Hardcover. Very Good.